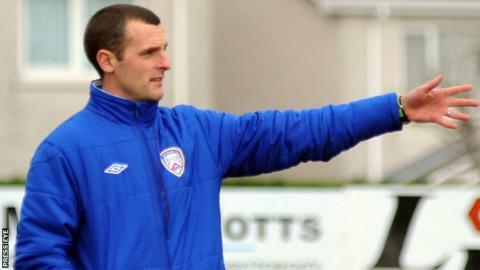 Oran Kearney has been given a one-year extension as Coleraine manager after "careful consideration" by the board. The club finished a disappointing seventh in the Irish Premiership table, 14 points off the end of season split. A club statement confirmed Kearney, who has been manager since 2011, has agreed to "a number of clear and absolute objectives" for the season ahead. Kearney has appointed former Linfield and Glenavon defender William Murphy to join his backroom team. The club stated: "after a disappointing season for both the fans and club as a whole, the Coleraine FC board has taken time to reflect on the position of (the) manager". "Following careful consideration, the board has offered a new one-year contract to the manager, in which a number of clear and absolute objectives have been specified. "Oran has agreed to the terms of the contract offer and will thus continue in the position of Coleraine FC manager." Kearney was appointed Bannsiders' boss in 2011 after a spell in charge of Limavady United.